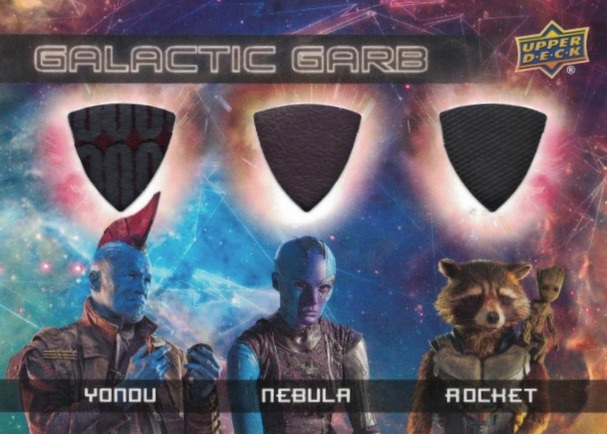 The protectors of the universe reunite on the screen and in 2017 Upper Deck Guardians of the Galaxy Vol. 2. 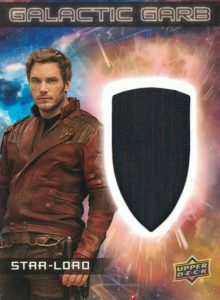 The Marvel release promises one premium hit along with one memorabilia card in every hobby box. 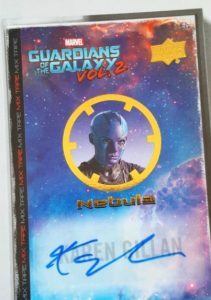 Collectors likely know that the original Guardians of the Galaxy movie also had a comprehensive set with a star-studded autograph checklist featuring Chris Pratt, Dave Bautista and Zoe Saldana. Consisting of 80 base cards along with 10 character/poster cards, the 90-card main set also features a foil parallel rainbow to collect. Combining to average one per pack, parallel options include Bronze Foil (1:1.45 packs), Blue Foil (#/199), Purple Foil (#/99), Red Foil (#/49), and Pink Foil (#/10) editions. In addition, standard inserts provide more details about the film. Each falling at 1:3 packs, themes include Behind the Lens, Family of Oddballs and Spaceships. 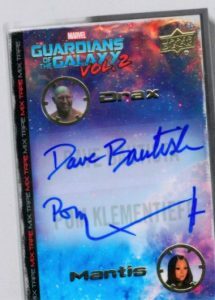 Just like the Volume 1 set, 2017 Upper Deck Guardians of the Galaxy Vol. 2 brings a premium element to the table. Among these are Actor Autograph inserts in Single and Dual versions. There are also Single and Dual Autograph Memorabilia cards to chase. 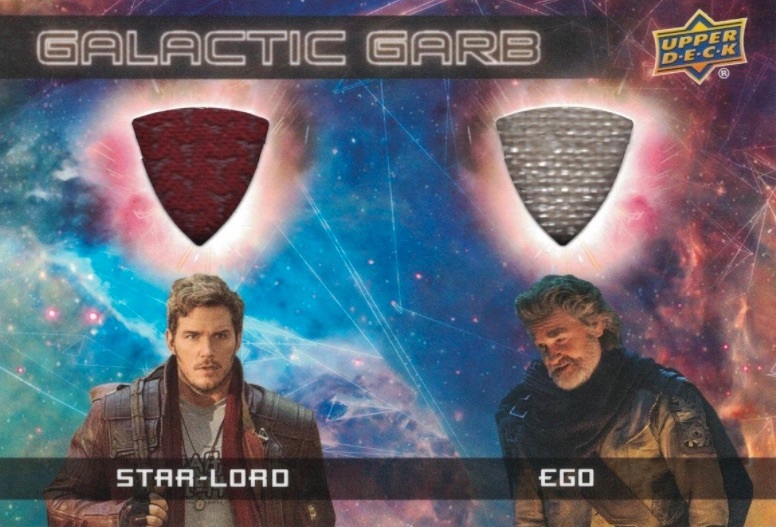 Averaging one per hobby box, the Galactic Garb Memorabilia cards offer Single, Dual, Triple and Quad editions that contain authentic relic pieces. 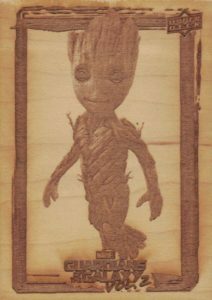 Groot's Roots Wood inserts apply the lovable tree-alien to cards made of 100% birch wood. 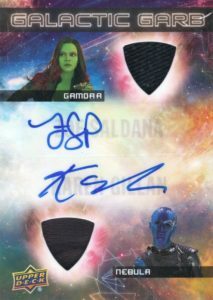 Closing out the product, 2017 Upper Deck Guardians of the Galaxy Vol. 2 adds a 5 x 7 Box Topper in every hobby box. Meanwhile, the 5 x 7 Sketch cards are a case hit. 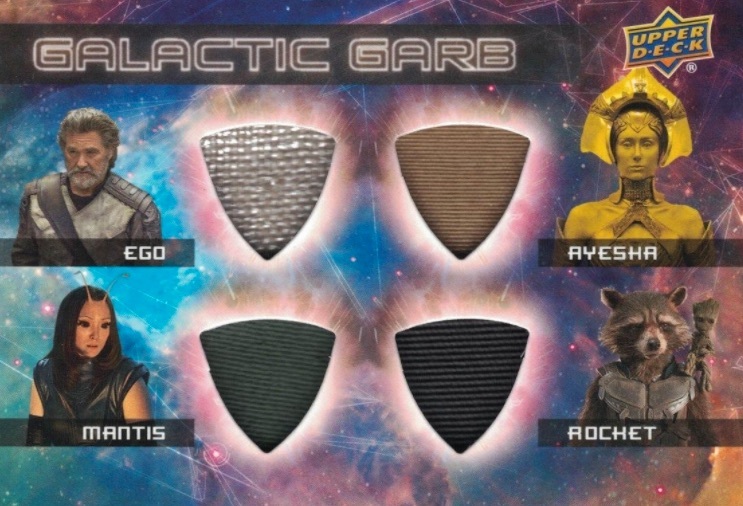 There is also an exclusive promo set for GotG Vol. 2 found in Hanes product at Walmart locations. PARALLEL CARDS: Bronze (1:1.45 packs), Blue Foil #/199, Purple Foil #/99, Red Foil #/49, Pink Foil #/10. 15 cards. 1:43 packs. Shop autographs on eBay. 10 cards. 1:325 packs. Shop on eBay. 25 cards. 1:10 packs. Shop relics on eBay. 15 cards. 1:24 packs. Shop relics on eBay. 15 cards. 1:30.3 packs. Shop relics on eBay. 10 cards. 1:48 packs. Shop relics on eBay. 5 cards. 1:195 packs. Shop on eBay. 5 cards. 1:1,200 packs. Shop on eBay. 10 cards. 1:65 packs. Shop on eBay. 73 artists. 1:52 packs. Shop sketch cards on eBay. looks good. I bought a box and found a Rocket Glactic Garb but its not listed here…it is sm-26…..is this a ssp?